Thomas Jackson Park, aka Mystified, goes on pioneering the virgin depths of ambient experimental music, setting a nice example through his devotion to the genre and his prolific releases; and today we shall discuss his new album, released on Webbed Hand Records, which is called “Bone Drones 3”. This four-track album is represented by thoughtfully and fancifully processed sounds, initially generated on trombone. Even though the sound was processed, it preserved its naturalness and the warmth of life, breathed by the artist himself in its direct and figurative sense, because aerophones are silent without human exhalations. The first track, “Bone Drone 11” turns out to be the airy and pleasant cushion of sound, which firstly seemed to me the work of an orchestra, as well as the other tracks. However, getting some information from the official release page I learnt, that all these enveloping and monumental substances are the result of Mystified’s keenness of wit, who has the sharp feeling of space, time, music and mood; he knows how to turn the sonic fluction into the right way. 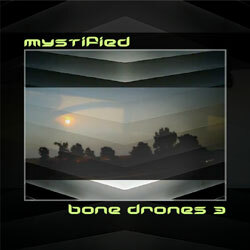 So, let’s sink in the atmosphere of Mystified’s “Bone Drones 3”.